● IQ OPTION Review 2019 + My Experience - Scam or Not? Is IQ OPTION a scam OR one of the best trading platforms in the world ? Don’t Sign Up Before You Read This IQ OPTION Review! Me and my colleague have performed a thorough IQ OPTION review, without the broker knowing it of course. Here is our true experience! Islamic accounts are available ! **Your capital might be at risk. Forex pairs available 22 currency pairs available !! While gold is the only one commodity and only six different stock indices are offered, the selection for the other two categories is significantly larger. Even if one or the other may find this selection too small, our experience has shown that the values ​​for the trade seem to have been carefully chosen. With the exception of indices, 24 hours a day trading is possible in all categories, with at least one asset from a specific sector being always available in the equities category. Thus, strategies that focus on a specific economic segment are very well possible. A quick glance at the foreign exchange offer: All combinations of the majors and some other currencies such as the New Zealand dollar, the Russian ruble or the Swiss franc can be traded here. There are a total of 22 pairs are available. IQ OPTION offers you the opportunity to trade a total of 22 currency pairs. You have at your disposal not only the major currency pairs (EURUSD USDGBP, etc.) but also some smaller world currencies such as the New Zealand dollar, Russian ruble which can also be traded in combination with major currencies €, USD, British pounds etc. As the name of broker implies, IQ OPTION started as top notch binary options brand but has quickly turned into global trading brand (not only binary options but all kinds of trading instruments! Traders can use put options to speculate on falling prices, and use call options to bet on rising prices. Turbo options with particularly short expiration time frames with durations of 30 and 60 seconds are also available for trading, but due to the associated high risk, they are more suitable for more experienced traders. Particularly noteworthy is the fact that investors can also trade on the weekend when the regular trading venues are closed. For this, IQ Option offers OTC trading. This abbreviation stands for “over the counter” and means that trading takes place directly between the parties, ie between the broker and the investor, outside the regular stock exchange. Interesting are the regularly organized competitions in which traders can compete against other traders. As of 2nd July 2018 ESMA European Union has forbidden the trading of Binary Options to retail traders who are European Union citizens. A brand new offering that was recently added into portfolio of trading instruments. FX Options are basically a combination of real option trading and forex trading. Why is it better than binary options ? there is not anymore “0 or 1” OR “earn something or loose all” principle – meaning even in case you dont guess the trade right, you will not lose the whole amount you put at stake ! We think they will add more and more cryptos over time, as new ones become popular. So far we think this choice is wide enough. As the only commodity currently available, the precious metal gold can also be traded as a binary option. At the moment there are 49 Stocks available for trading. Nowadays traders have up to 79 different asset classes available from commodities, forex, indices and stocks. The only commodity currently available is only GOLD and the stock indices are only six, the choice of stocks is much wider than the other two categories. Stock indices are focused on London stock exchange index (FTSE 100), Frankfurt (DAX 30), Paris (CAC40) and New York (S&P500 / NASDAQ / Dow Jones). Besides many European and American stock titles, some Asian shares such as Toyota and Bank of China are available for trading. Overall we can say that the emphasis is put on stocks from banking and financial services, energy, the internet and telecom industry with which you can speculate. 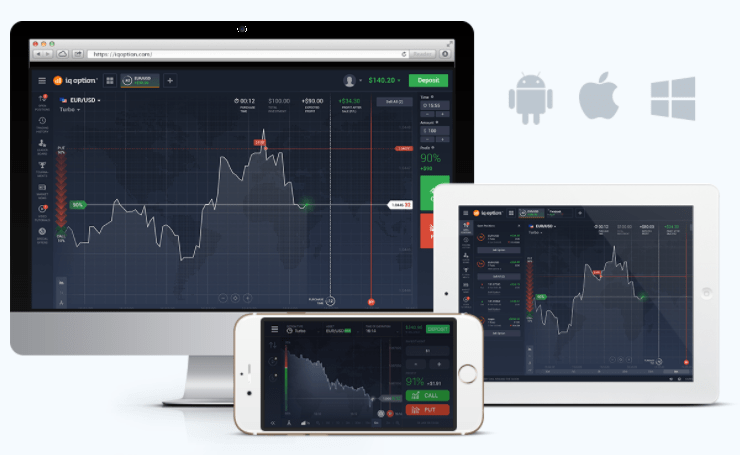 You can trade via mobile Apps, webtrader or standalone platform. Unfortunately, there are currently NO bonuses offered! IQ Option Europe Ltd. is registered at Cyprus, and is regulated by CySEC. IQ Option Ltd. is registered at Seychelles, this entity is not regulated. In addition to the two credit card variants VISA and MasterCard, IQ Option investors also have the option of using a number of internet payment services for deposits and withdrawals. The list of available providers includes Skrill, Neteller, Webmoney, and of course WireTransfer. These services handle payments very reliably. However, no detailed information is available on the fees charged when using IQ Option service for payment services. It is therefore advisable to contact customer service on this matter in order to clarify this. Because even the general terms and conditions help in this case only conditionally, as these currently, like many other contents, are only available in English. Here, from the customer’s point of view, there is still room for improvement. Incidentally, the minimum deposit that IQ Option requires from customers is relatively modest at just $10. There is, of course, a demo account where you can practice your trading strategies without any risk using $10.000 virtual money. You can trade all types of assets completely stress free. During OUR test we noticed that IQ OPTION platform and OVERALL services THEY OFFER are a step ahead compared to the competition! No wonder that they survived the big cleanup in binary options industry and now start to take their share in forex trading industry. Let us explain you why. First of all, during our test, we noticed, that this brand puts really strong emphasis on trader’s education + on the quality and constant improvement of their trading software and last but not the least on the security of client’s funds. Secondly, according to what we noticed, the client verification process is in line with the strictest regulation rules. In other words, IQ OPTION is one of few brokers out of all forex brokers that we tested, where you as a trader have the feeling that they want you to trade profitably and stay with them for long term, instead of just taking your money and run away (which is usually the case with many other brokers in this industry). That’s indeed a good signal for a new trader! Last but not the least .. we think they have really knowledgeable customer support. Similar as competition, IQ OPTION is available by phone, email, and live chat. In addition, there is also a mailing contact (a little old-fashioned but you never know when you will need it). Upon calling for customer service, a responsible client support person will either immediately pick up the line and and try to resolve your issue right away OR the system will create a so called “Problem Ticket Nbr.” where you report a problem, and employees will call you back later. This is a nice service to have, because it could perhaps save you a lot of money on your phone bills. Recently recovered my funds from a scam broker, i hired a professional it was quick and efficent. Happy to share my experience with others.